William Stewa rt Cruikshank was the builder whose company constructed the King’s Theatre, Edinburgh, which opened in 1906. The original consortium that commissioned the theatre ran out of money, so Cruikshank put together another company that completed the building and owned the theatre. His son, Alexander Stewart Cruikshank, then became director of the theatre. In 1928, A. S. Cruikshank merged the King’s with the theatrical company Howard & Wyndham, who owned the Lyceum and theatres in Aberdeen, Dundee, Glasgow and London. He became manager director of Howard & Wyndham, and sat on other theatrical boards. According to The Scotsman newspaper, he “was regarded as the most powerful man in the British theatre industry”. After he was killed in a motor cycle accident in 1949, his son, Stewart, became managing director. The connection between Howard & Wyndham and the Cruikshank family continued into the 1970s. 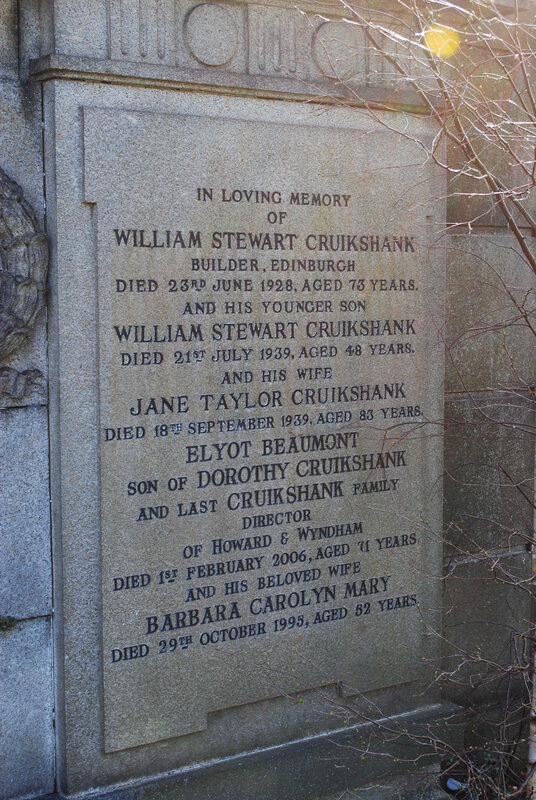 William Stewart Cruikshank was born on 19th April 1855 in Aberlour, Banffshire, one of 11 children. He and his brothers moved south to Edinburgh where they established their building firms. William married Jane Taylor Beck (1856-1939), and they had at least two children. William died on 23 June 1928, and Jane died 11 years later on 18 September 1939. 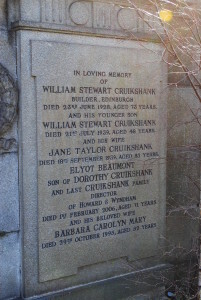 The youngest of their children, also William Stewart (1891-1939) was a motor engineer, who died at the age of 48. His brother, Alexander Stewart Cruikshank (1877-1949), married Kitty Brown Scott (1878-1974) and they had two children, Stewart (1908-1966) and Dorothy (1902-1979). Dorothy married Edward John Beaumont (1903-1979) and their son, Elyot Beaumont (1935-2006), was the last of the Cruikshank family to serve on the Howard & Wyndham board. He married Barbara Caroline Mary (1943-1995), but her surname is not recorded.